So you wanna create your own website for your Baby? Who wouldn’t? There’s no doubt that no baby is more special to you than your very own, so it’s perfectly natural to want to share your joy with the entire world on the World Wide Web. Just one catch, of course: Maybe you don’t know how to make a website! But that’s no problem these days either, since you’ve got lots of options, ranging from do-it-for-me easy on one end, outsourcing altogether on the other end, and templates that let you customize things using some of your site-savvy somewhere in between the two. 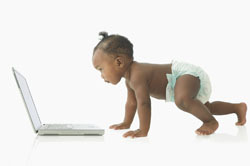 The quickest and easiest option is to use a free baby website services such as totsites.com and babiesonline.com. These sites allow you to setup your free baby website in minutes without any technical knowledge. However if you would like a custom programmed design or to use your own url this might not be the best option for you. There are many blogging software tools available these days, but WordPress is arguably the best. What makes it even cooler for creating your own baby website is the plethora of freely available themes to instantly give your website the unique character you want it to have. Note that there two versions of WordPress. The first is WordPress.com, a hosted version with not as many available themes and options. And then there’s WordPress.org, where you can download the software to use on your own server. This is the option you’ll want if you want to go all-out in making your site your own, and the setup is really a snap. Check out the setup docs if you don’t believe me. HomeStead.com, Weebly.com, Yola.com, and SquareSpace.com are only a few options for platforms that will easily let you create a website for a Baby without any technical skill. Everyone will have her own preference, so spend some time playing with each to see which you like the best. Your baby’s website is worth your investment of time and energy, right? If you’re going for customization to the max, you might do well to consider outsourcing your project to a dedicated Web dev shop, either in the U.S. or abroad. The advantage of going abroad with it is cost-you’ll likely save a boatload of money. The downside is that quite often foreigners working offshore live and work in very different time zones or may not understand English as well as you do to communicate fluidly with you. Nonetheless, creating a website for Baby isn’t that big of a project for seasoned pros, so test your luck anyway. Sites like Elance.com, ScriptLance.com, Guru.com and others have sprung up to make finding the right outsourcing partner much easier and more cost effective. And they are free for you to use. Which option you’ll choose depends on your goals for your baby website, in addition to how big your budget is to accomplish those goals. Keep things in perspective. For example, don’t go breaking the bank on a commemorative site if you think starting to save towards Baby’s pre-school and future education is more important. But whatever you decide, you’ve now got the right tools at hand to produce a website for your Baby you can be truly proud of! Click here to create your own personalized baby website in minutes. Great post… keep it coming! I only wish there were more websites like this.